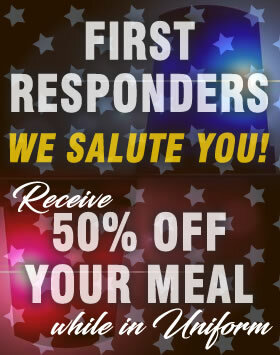 We’d like to shout out a BIG THANK YOU to First Responders for all they do that goes unnoticed – but since they can’t ALL hear us, we’ll just do this… Visit any of our Creek Bottom Brewing locations in uniform, present your ID and you will receive 50% OFF your meal. We invite all employees and volunteers of the Police & Fire Departments, Rescue Squads, and Ambulance EMT’s to stop in and have half a meal on us. We APPRECIATE your service!